Faniel graduated from Knight High School in 2010. He is 6’6″, 205 and is that quiet player that you do not even notice until the game starts. Faniel always seems to be at the right place at the right time for the interior pass and the offensive rebound. In this year, Vadal was named to the Foothill Conference second team and the State Tournament final four first team. 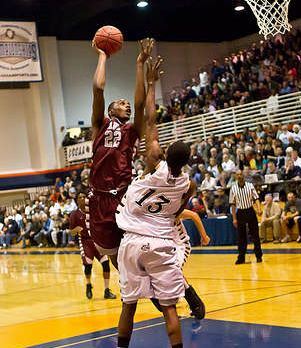 He scored 8.0 ppg and pulled down the third highest number of rebounds for AVC…122…off the bench. He has a high level of skill around the basket and I especially like his mid-range jumper, his agressive rebounding, and his ability to run the floor. Vadal Faniel is a tough guy. He lost his father this summer and he helped his family through one of the toughest things a young man can experience. “V” missed only 3 practices in the summer season and led AVC to a 7-1 record in the 8 game showcase season. He led the team in scoring, rebounding and showed his outstanding midrange shooting along with his post skills. Vadal was invited to the All-American Showcase in Las Vegas where he continued his outstanding play. Just keeps getting better and better.